Indulge yourself in premier luxury accommodation right on the beachfront. 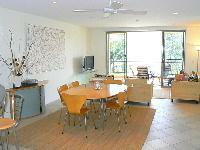 Immerse yourself in the luxury and style of Byron Bay's premier self contained apartments. Located close to Byron town centre, these sought after Byron Bay apartments are situated directly across the road from Main Beach. 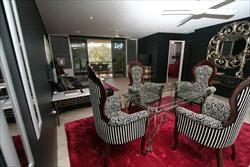 Each apartment has been individually decorated with attention to detail. 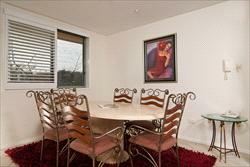 They are spacious and light with comfortable living areas, marble bathrooms and kitchens with granite bench tops. 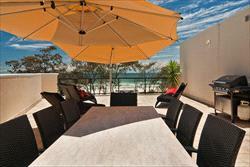 The private balconies offer some fantastic views of Byron's beautiful beaches. Take advantage of the salt water pool and large barbecue entertainment area or stroll casually to Byron's first class eateries and shops. This luxury accommodation in Byron Bay is the perfect location for couples and families to enjoy that special holiday escape. 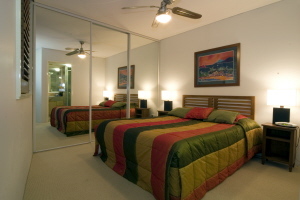 Air Conditioned in Living Areas & Ceiling fans in bedrooms. NOTE: LOTS OF INTERNAL STAIRS. 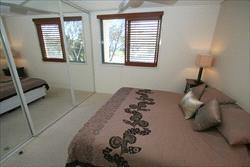 Air Conditioned in Living Area & Ceiling fans in bedrooms. Booking must have a Parent or be 21. 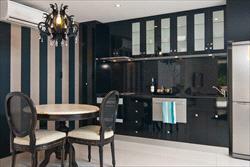 An ultra modern 1 bedroom apartment that will satisfy the most discerning guest. In summer enjoy the private spacious courtyard with your own BBQ and luxury daybed directly opposite Byrons Main Beach. In winter curl up in front of the fireplace and watch the latest movies on the plasma TV or you can forget the TV and enjoy the seclusive delights of the 2nd fireplace in the comfort of your bedroom. King size bed with the finest Egyptian cotton sheets. This Apartment has its own Luxury spa bath. Spacious bathroom with the latest fittings and finishes. The sleek kitchen has European appliances that will enhance the pleasure of your private dining. The perfect destination for a romantic getaway. Apartment 4 An ultra modern 1 bedroom apartment that will satisfy the most discerning guest. In summer enjoy the private spacious courtyard with your own BBQ and luxury daybed directly opposite Byrons Main Beach. This is a two-bedroom Air Conditioned Apartment, which has been completely refurbished. It is located on the ground floor with a large furnished courtyard offering off the street access. The master bedroom has a queen size bed and ensuite and second television. The second bedroom has two single beds that can be made up as a king size bed if required. There is a second bathroom with bath, separate toilet and laundry facilities. The dining area adjoins the kitchen that is equipped with dishwasher, oven, cook top and full size fridge. The lounge area has Austar TV, stereo and DVD player. The apartment wraps slightly around the corner with views across the park. Apartment 5 This is a two-bedroom Air Conditioned Apartment. It is located on the ground floor with a large furnished courtyard offering off the street access. The master bedroom has a queen size bed and ensuite and second television. The second bedroom has two single beds that can be made up as a king size bed if required. There is a second bathroom with bath, separate toilet and laundry facilities. 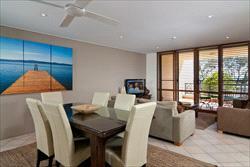 The dining area adjoins the kitchen that is equipped with dishwasher, oven, cook top and full size fridge. The lounge area has Austar TV, stereo and DVD player. The apartment wraps slightly around the corner with views across the park. Two-bedroom ground floor apartment with furnished courtyard and off street access. The main bedroom has a Queen & 2nd bedroom 2 x Singles. 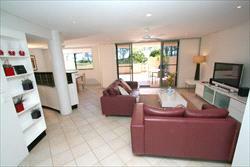 This is a very popular apartment on the first floor with front facing views over Byrons famous main beach. It has three bedrooms. The master bedroom has a king size bed and ensuite and second television. The two other bedrooms both have two single beds. There is a bath in the second bathroom as well as separate toilet and laundry facilities. The dining area adjoins the kitchen and lounge. The kitchen is fully equipped with dishwasher, microwave, oven, cook top and full size fridge. The lounge area has Austar wide screen television, stereo and DVD player. The balcony is furnished offering a lovely area to relax and take in the scenery. 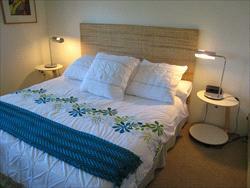 The apartment is air-conditioned and has just been refurbished. 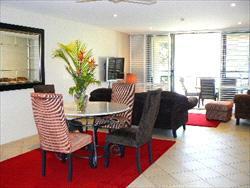 Apartment 8 This is a very popular apartment on the first floor with front facing views over Byrons famous main beach. It has three bedrooms. The master bedroom has a king size bed and ensuite and second television. The two other bedrooms both have two single beds. There is a bath in the second bathroom as well as separate toilet and laundry facilities. The dining area adjoins the kitchen and lounge. 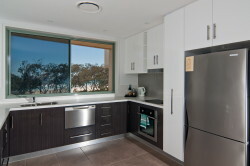 The kitchen is fully equipped with dishwasher, microwave, oven, cook top and full size fridge. The lounge area has Austar wide screen television, stereo and DVD player. The balcony is furnished offering a lovely area to relax and take in the scenery. 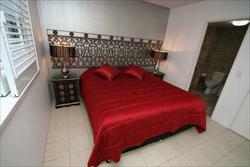 The apartment is air-conditioned and has just been refurbished. This very spacious four-bedroom apartment is on the first floor offering fantastic views of Byrons Main Beach from the furnished balcony. The master bedroom has a king size bed with ensuite and second television. The second bedroom has a king size bed, the third has a queen bed and the fourth bedroom has a double bed. The second bathroom has a bath, there are also separate toilet and laundry facilities. The dining area adjoins the kitchen and lounge. The kitchen is fully equipped with dishwasher, microwave, oven, cook top and full size fridge. The second lounge area has a Plasma screen TV, DVD, Austar cable service and stereo. This apartment has reverse cycle air-conditioning. Apartment 9 This very spacious four-bedroom apartment is on the first floor offering fantastic views of Byrons Main Beach from the furnished balcony. The master bedroom has a king size bed with ensuite and second television. The second bedroom has a king size bed, the third has a queen bed and the fourth bedroom has a double bed. The second bathroom has a bath; there are also separate toilet and laundry facilities. The dining area adjoins the kitchen and lounge. The kitchen is fully equipped with dishwasher, microwave, oven, cook top and full size fridge. The second lounge area has a Plasma screen TV, DVD, Austar cable service and stereo. This apartment has reverse cycle air-conditioning. Situated on the first floor this apartment offers fantastic ocean views from the private furnished balcony. The spacious apartment has just been refurbished. The master bedroom has a king size bed and ensuite and second television. In the second bedroom there are two king single beds. The second bathroom has a bath, there are also separate toilet and laundry facilities. The dining room adjoins the kitchen and lounge. The kitchen is fully equipped with dishwasher, microwave, oven, cook top and full size fridge. 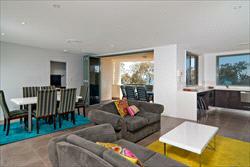 The lounge area has Austar television, stereo and DVD player and the apartment is air-conditioned. Apartment 10 Situated on the first floor this apartment offers Fantastic Ocean views from the private furnished balcony. This spacious apartment has just been refurbished. The master bedroom has a king size bed and ensuite and second television. In the second bedroom there are two king single beds. The second bathroom has a bath; there are also separate toilet and laundry facilities. The dining room adjoins the kitchen and lounge. The kitchen is fully equipped with dishwasher, microwave, oven, cook top and full size fridge. 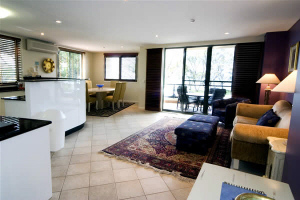 The lounge area has Austar television, stereo and DVD player and the apartment is air-conditioned. This apartment has two bedrooms and is on the first floor. The balcony is furnished and offers ocean views. 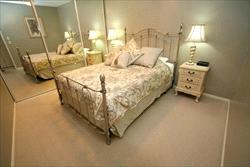 The master bedroom has a queen size bed and ensuite and second television. The second bedroom has two single beds. The second bathroom has a bath, there are also separate toilet and laundry facilities. The dining room adjoins the kitchen and lounge. The kitchen is fully equipped with dishwasher, microwave, oven, cook top and full size fridge. The lounge area has Austar television, stereo and DVD player. This apartment is air-conditioned. Apartment 11 This apartment has two bedrooms and is on the first floor. The balcony is furnished and offers ocean views. The master bedroom has a queen size bed and ensuite and second television. The second bedroom has two single beds. The second bathroom has a bath; there are also separate toilet and laundry facilities. The dining room adjoins the kitchen and lounge. The kitchen is fully equipped with dishwasher, microwave, oven, cook top and full size fridge. The lounge area has Austar television, stereo and DVD player. This apartment is air-conditioned. This two-bedroom apartment is situated on the first floor. The balcony is furnished and offers views across the park to the ocean. The Apartments decor is Funky. 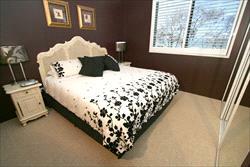 The master bedroom has a queen size bed and ensuite and second television. The second bedroom has two single beds. The second bathroom has a bath, there are also separate toilet and laundry facilities. The dining room adjoins the kitchen and lounge. The kitchen is fully equipped with dishwasher, microwave, oven, cook top and full size fridge. 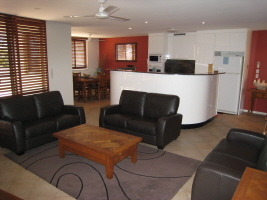 The lounge area has Austar television, stereo and DVD player and the apartment is air-conditioned. Apartment 12 This two-bedroom apartment is situated on the first floor .The balcony is furnished and offers views across the park to the ocean. The Apartments decor is very funky. The master bedroom has a king size bed and ensuite and second television. The second bedroom has two single beds The second bathroom has a bath; there are also separate toilet and laundry facilities. The dining room adjoins the kitchen and lounge. The kitchen is fully equipped with dishwasher, microwave, oven, cook top and full size fridge. 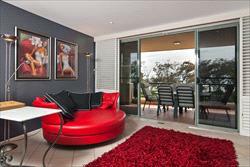 The lounge area has a Plasma screen TV, DVD, Austar cable service and stereo. This is a premium three-bedroom air-conditioned apartment on the top floor with a furnished balcony offering fantastic views over Byrons Main Beach. The master bedroom has a king size bed with ensuite and a second television. The second bedroom has a double bed and in the third there are two singles. The second bathroom has a bath, there are also separate toilet and laundry facilities. The dining room adjoins the kitchen and lounge. The kitchen is fully equipped with dishwasher, microwave, oven, cook top and full size fridge. 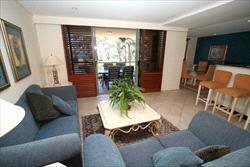 The lounge area has a Plasma screen TV, DVD, Austar cable service and stereo. Apartment 13 This is a three-bedroom Ducted air-conditioned apartment on the top floor with a furnished balcony offering fantastic views over Byrons Main Beach. 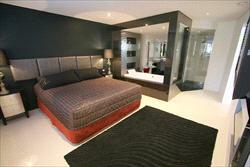 The master bedroom has a king bed with ensuite and a second television. The second bedroom has a queen bed and the third is a double bed. The second bathroom has a bath; there are also laundry facilities. The kitchen adjoins the dining and lounge. The kitchen is fully equipped with dishwasher, microwave, oven, cook top and full size fridge. The lounge area has a Electric Fireplace a Plasma TV, DVD, Austar. This is a large three-bedroom penthouse apartment on the second floor with a furnished balcony offering wonderful views of Byrons famous Main Beach. The master bedroom has a king size bed and ensuite. The second bedroom has a queen size bed and in the third bedroom there are two singles with a second television and video. The second bathroom has a bath, there are also separate toilet and laundry facilities. The dining room adjoins the kitchen and lounge. The kitchen is fully equipped with dishwasher, microwave, oven, cook top and full size fridge. 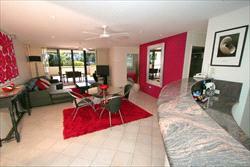 The seperate TV area has a Plasma screen TV, DVD, Austar cable service and stereo. The apartment is air-conditioned. Apartment 14 This is a large three-bedroom penthouse apartment on the top floor with a furnished balcony offering wonderful views of Byrons famous Main Beach. The master bedroom has a king size bed and ensuite. The second bedroom has a queen size bed and in the third bedroom there are two king singles with a second television and video. The second bathroom has a bath, there are also separate toilet and laundry facilities. The dining room adjoins the kitchen and lounge. The kitchen is fully equipped with dishwasher, microwave, oven, cook top and full size fridge. 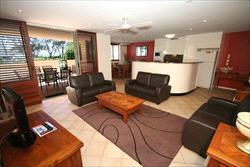 The lounge area has a Plasma screen TV, DVD, Austar cable service and stereo. The apartment is air-conditioned. This is a lovely two-bedroom apartment on the second floor offering marvellous views of Byrons Main Beach. The master bedroom has a king size bed and ensuite and second television. In the second bedroom there are two single beds. The second bathroom has a bath, there are also separate toilet and laundry facilities. The dining room adjoins the kitchen and lounge. The kitchen is fully equipped with dishwasher, microwave, oven, cook top and full size fridge. The lounge area has Austar television, stereo and DVD player. The apartment is air-conditioned. 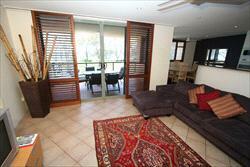 Apartment 15 This is a lovely two-bedroom apartment on the top floor offering marvellous views of Byrons Main Beach. The master bedroom has a king size bed and ensuite and second television. 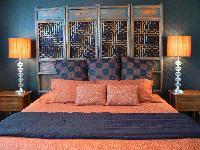 In the second bedroom there are two single beds that can be made up as a king size bed if required. The second bathroom has a bath; there are also separate toilet and laundry facilities. The dining room adjoins the kitchen and lounge. The kitchen is fully equipped with dishwasher, microwave, oven, cook top and full size fridge. The lounge area has Austar television, stereo and DVD player. The apartment is air-conditioned. This two bedroom apartment is located on the second floor slightly around the corner with nice ocean views from the furnished balcony. Main bedroom a queen bed and ensuite. Second bedroom two single beds. Fully equipped Kitchen, Laundry. Air Conditioned.